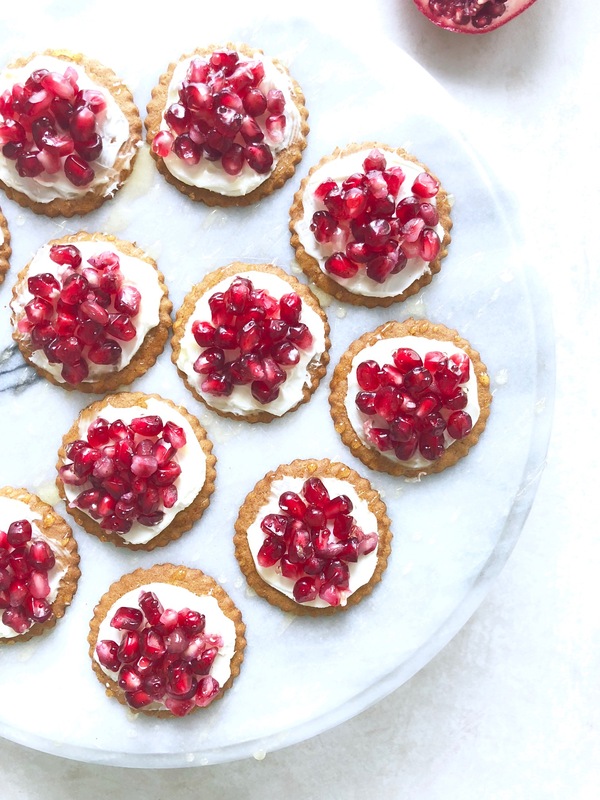 Delicious ginger cookies, topped with creamy mascarpone cheese, fresh seasonal pomegranate and a drizzle of honey – these spiced pomegranate cookie bites make the perfect, easy party appetizer! Last weekend Kevin and I attended a much-needed relaxing wine and cheese party with friends. It seems so hard to carve out time during the holiday season, but I am so glad we did. It was a blast sitting around the fire, reminiscing with old friends and overall, taking a pause from the hustle and bustle of the season to just breathe. 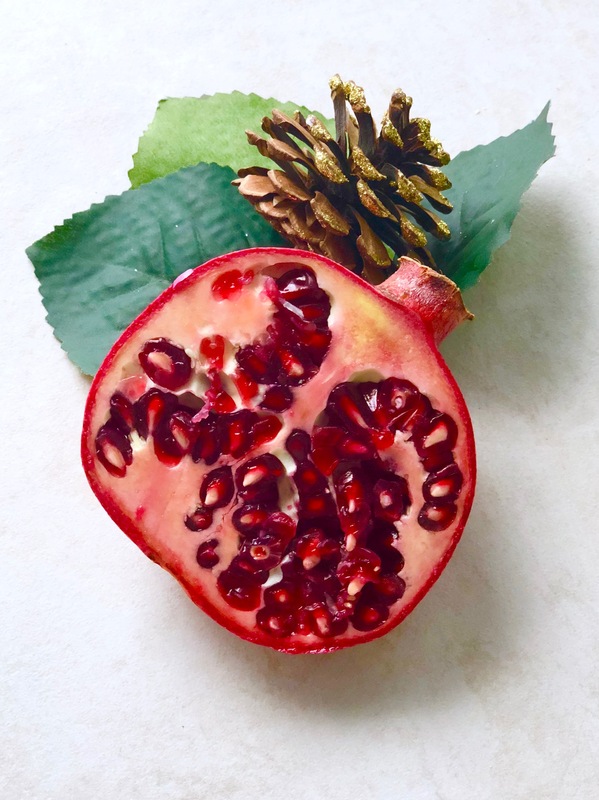 1) Slice off one end of the pomegranate approx 1/2 inch deep around the top knob. 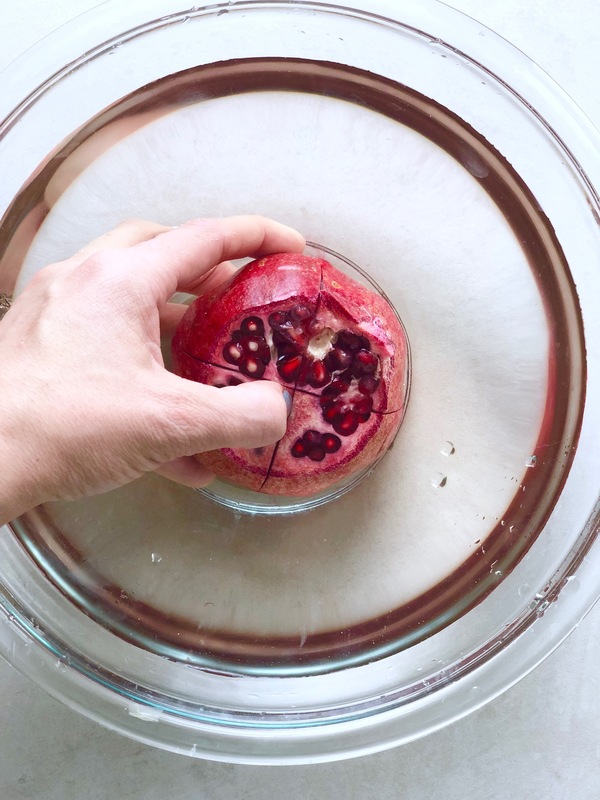 3) Completely submerge pomegranate in a bowl filled with water. Peel the fruit open under the water, gently pushing the seeds out into the water with your thumb and forefinger. The white pith should float to the top and the seeds will sink to the bottom. Skim off peel from the top of the water and strain seeds through a FINE MESH COLANDER. 4) Voila! 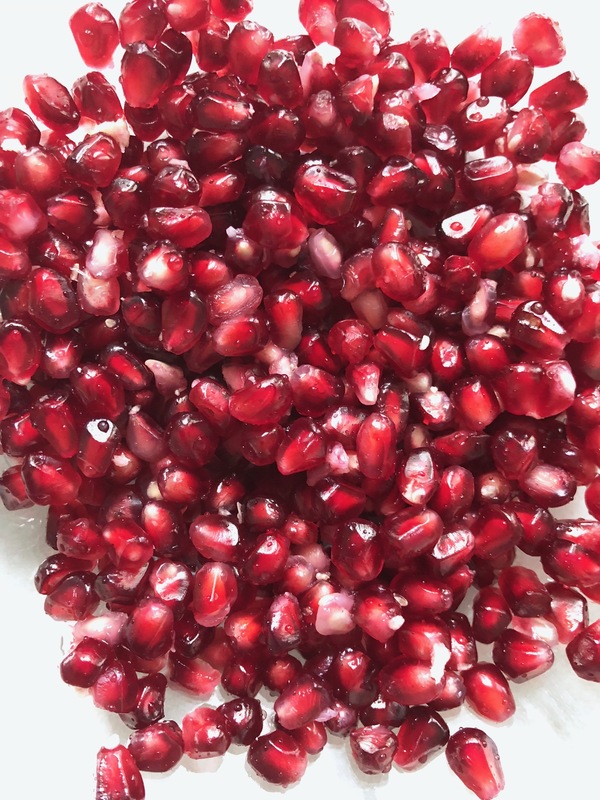 You have pomegranate seeds! Ok, back to the spiced pomegranate cookie bites. These are sooooo good you guys! 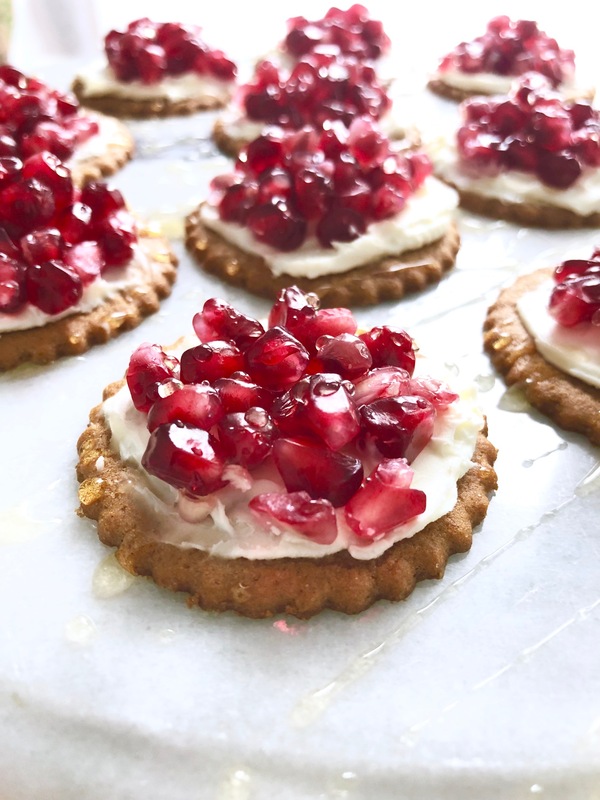 I originally made them on gluten-free crackers and they were awesome that way too, but there is something about pomegranates and mascarpone cheese on a spicy ginger snap with a drizzle of honey that make your taste buds come alive! I highly recommend using thick ginger cookies for this recipe. The thins tend to break and become mushy too easily, but the good ol’ fashioned thick ginger snaps hold up perfectly. If you love quick and easy low carb desserts, check out my 15 Healthy Weeknight Desserts ebook! It is free when you sign up to become an email subscriber. All recipes are under 250 calories and done in 5 minutes or less! Need another fun party appetizer idea? Check out these SWEET POTATO CASSEROLE BITES! They are soooo good and don’t require pre-cooking the potatoes! Delicious ginger cookies, topped with creamy mascarpone cheese, fresh seasonal pomegranate and a drizzle of honey. Makes the perfect, easy party appetizer! Prep pomegranate as shown in the post above. Top ginger cookie with 1 tsp mascarpone cheese, 1 tsp pomegranate seeds and drizzle with honey. This is easiest if you prep all the cookies first, place on serving tray and then drizzle with honey before serving. For best results, eat within 12 hours. Enjoy! This recipe is best on thick or normal sized gingersnap cookies. The thin cookies tend to become mush very quickly or break while assembling. For best results, make just prior to attending the party or assemble when you arrive! Yes they are the perfect flavor for all things Christmas…especially parties ;) I hope you love them! Ohh I love this! I made ginger snap cookies yesterday, so I will totally try this, woohoo :D Merry Christmas, Tiffany. Hope the party went great. Thank you the party was just what we needed ;) I bet this would be fantastic on homemade ginger snaps!! I’ll have to try your recipe and make them that way. Merry Christmas to you as well!